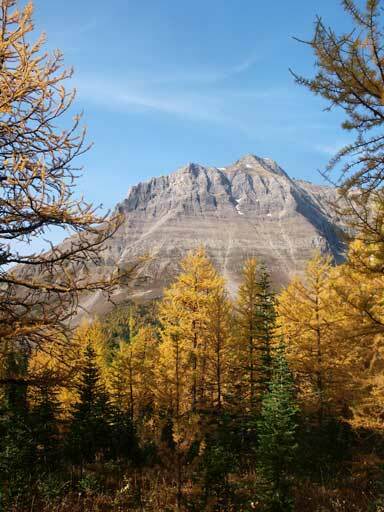 After a long dry period a lot of the “hard” peaks were back in shape. 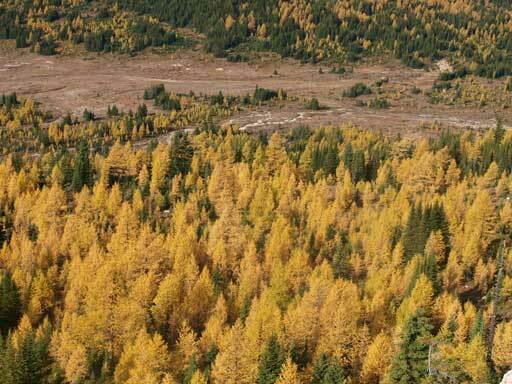 I’d really want to get another “climber’s scramble” done in this year, but on the other hand, I also wanted to take full advantage of this larch season. 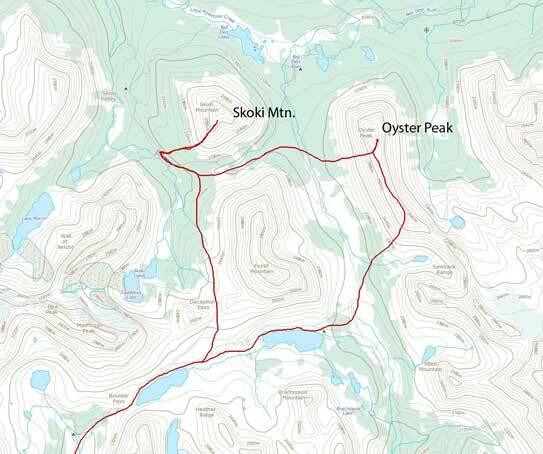 I threw out two possible objectives to a fellow Edmontonian peak bagger, Mike Mitchell (Arcturus): Oyster Peak to Skoki Mountain, or Mt. Daly + Mt. Niles. Mike chose the former. The distance (44 km) would be similar to a few insanely long traverses that I’d done earlier this year, but with much better trail system. We didn’t feel like starting to crazily early so set the alarm at 6 am. Within half an hour we started the trek. I didn’t carry anything fancy except for one jacket, food, and 1 L water with an UV filter. 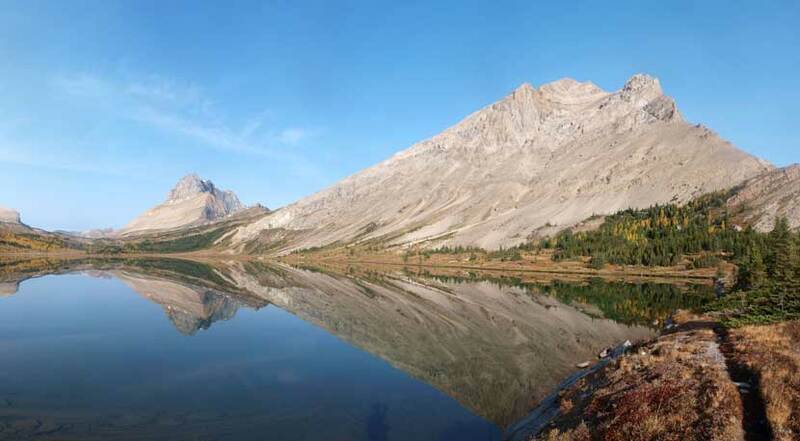 You don’t need to bring more than 1 L water into Skoki as there’re plenty of water sources. 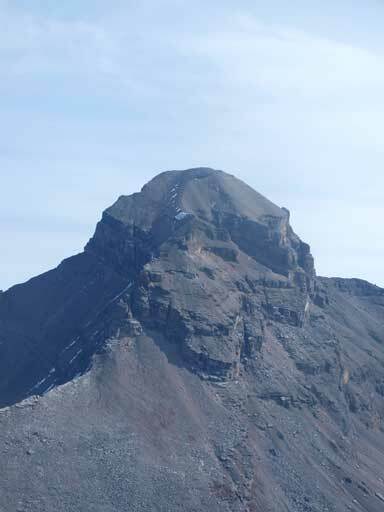 I felt really happy to travel light in Skoki, considering most people do these two peaks over 2-3 days. One word to describe the trudge up Temple Lodge road: boring, especially doing it with headlamp on. Good thing was, the road is only 4 km long.. About 45 min later a truck came up from behind and gave us a ride, which saved us 15 min walk. That’s a bonus! Because everything was in shade, we didn’t get distracted by the view, and we quickly made our way towards Hidden Lake and Boulder Pass. 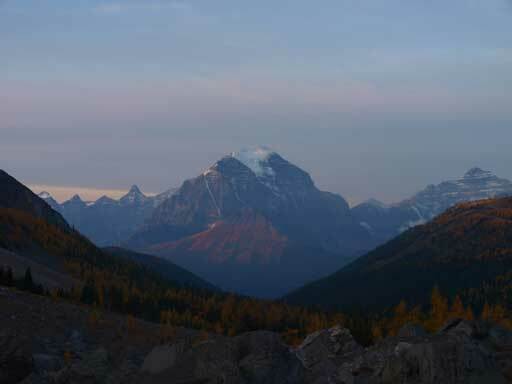 After passing the Hidden Lake campground, the trail started to gain elevation gradually, and the view started to fully open up. 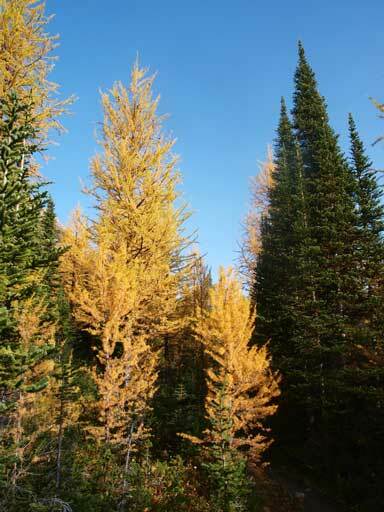 More and more larches showed up and we all knew it’s gonna be a gorgeous day ahead! All the sudden, we topped out on Boulder Pass. 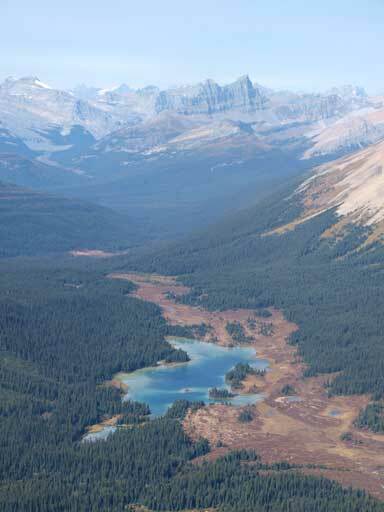 Looking down the other side, it sits Ptarmigan Lake. Apparently Mike has more photographing experience, and he suggested to circumvent the lake on its south (right) side, which turned out to be a good call. The path on this side was very faint and it was mostly boulder hopping and walking on boggy ground. 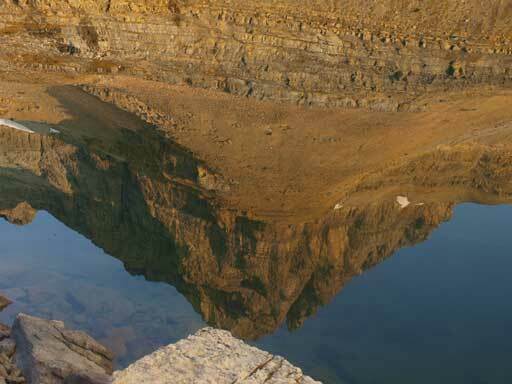 However, the reflection of Ptarmigan Peak made up for the extra work. 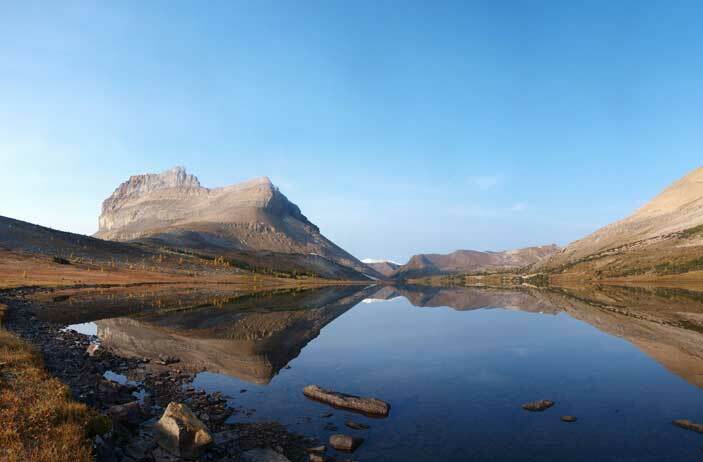 At Boulder Pass, Ptarmigan Lake on the other side. 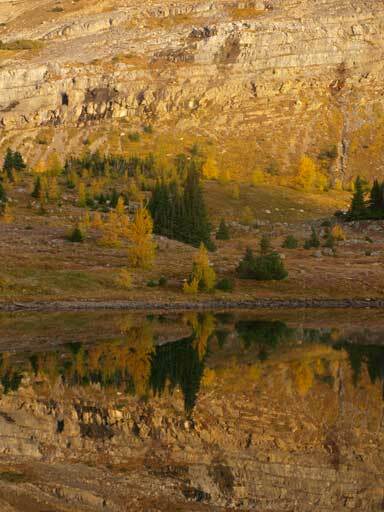 September in Skoki is GOLDEN! A close look at a small bump between Packer’s Pass and Deception Pass. 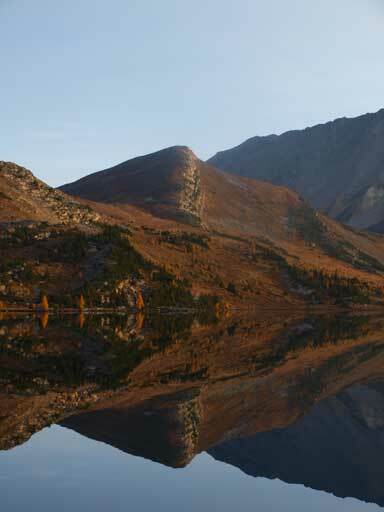 Ptarmigan Peak and Ptarmigan Lake again. Can’t ask for better! We regained the trail and followed it slightly uphill towards Deception Pass, before branching off to Baker Lake trail. From here on, we had to lose 200-300 m elevation to get to the base of Oyster Peak… Oh well, elevation loss and regain is the theme of this traverse, so make sure you get mentally prepared. 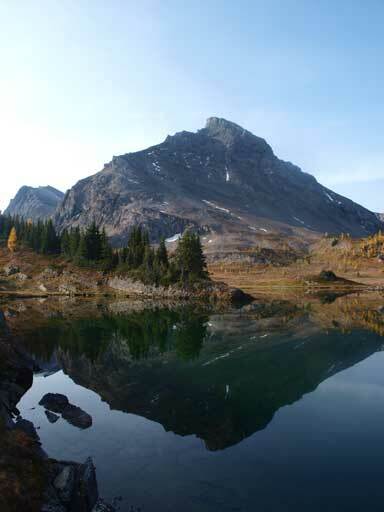 We soon made to Baker Lake. The morning sun was bad for photographing the lake, so again, Mike made a good call for doing another variation. We dropped down to the lake shore on the other side of the campground, and circumvented the lake for a few hundred meters. Another wow moment! 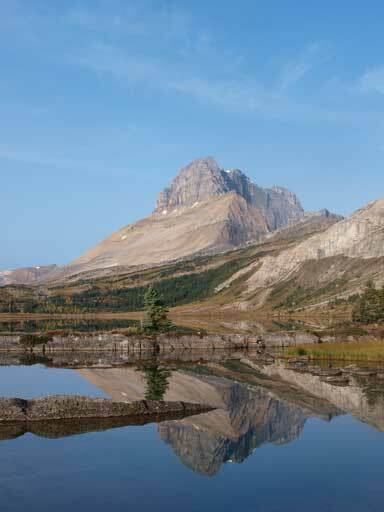 Awesome view of Ptarmigan Peak and its reflection! Now back on track. 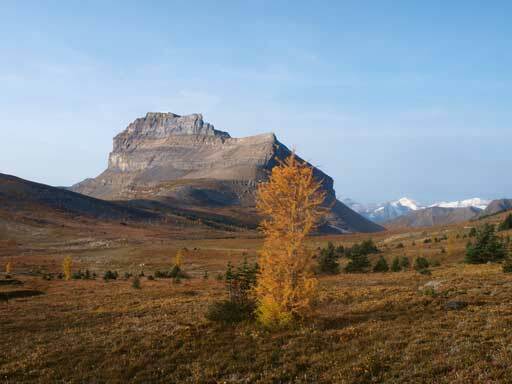 We followed the trail circumventing Fossil Mountain on its SE side, towards Cotton Grass Pass, the divide for Oyster Creek and Baker Creek. By now we were about 15 km from parking lot already. 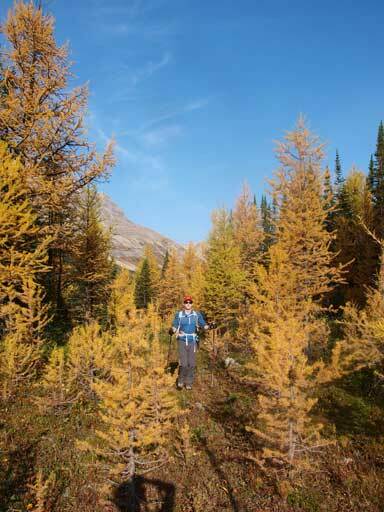 There were more larches waiting for us! 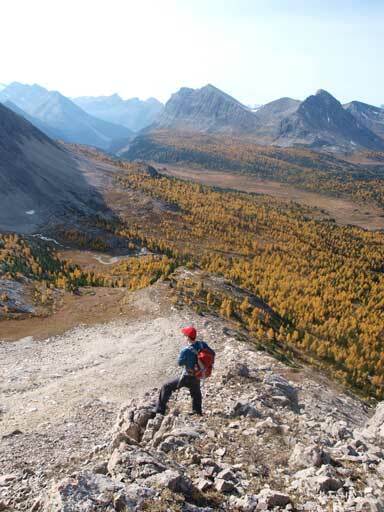 At the pass, we left the trail and bushwhacked up directly towards the face of Oyster Peak. I think it’s probably the first time I enjoyed bushwhacking. It’s quite a unique experience to bushwhack in larch forest! 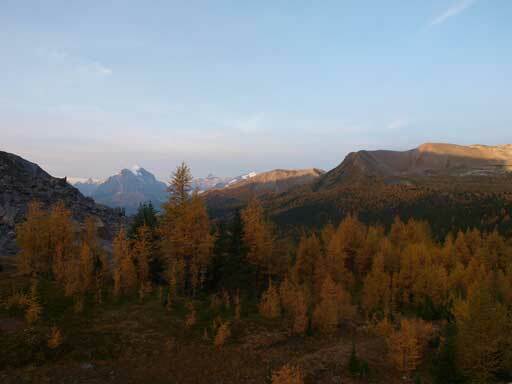 At treeline, we were treated by excellent view down to the valley. Fossil Mountain looked impressive from this side. 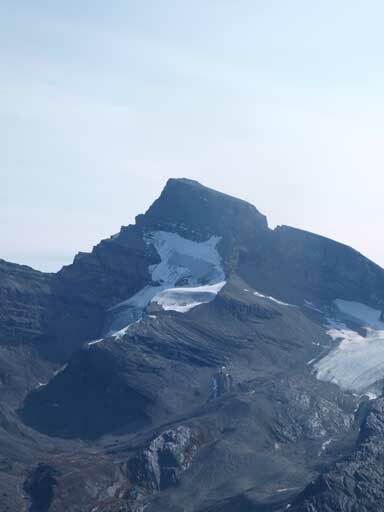 Skoki Mountain was also visible, oh man, that’s a long long way to go. Our objective, Oyster Peak. The summit of on left side though. Going up the south peak. 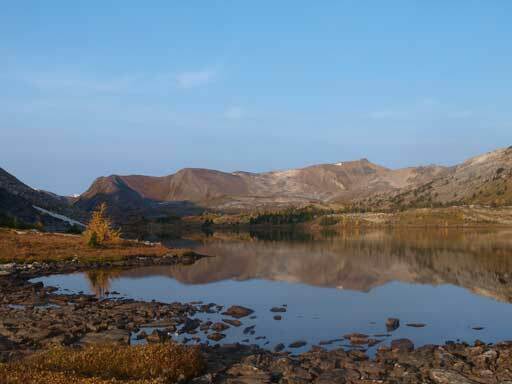 A panorama view of Cotton Grass Pass area. 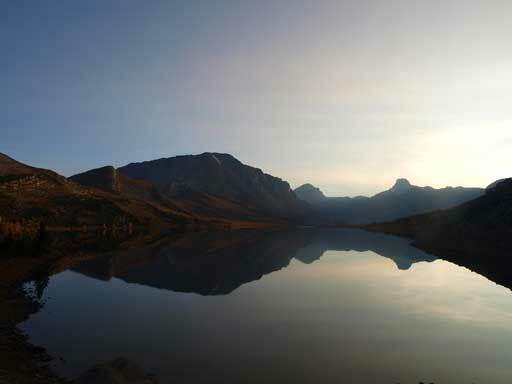 Fossil Mountain is the prominent one. 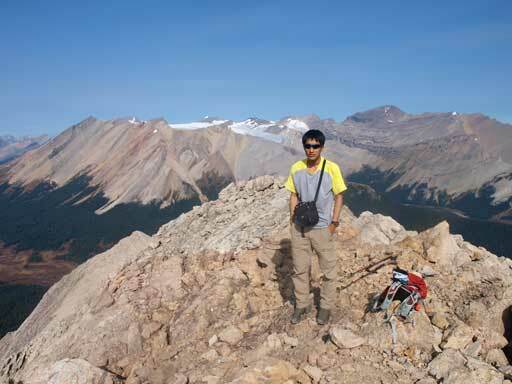 There were hands on sections here and there, and we quickly made to the south peak. The view was foreshortened and it took us longer than anticipated. 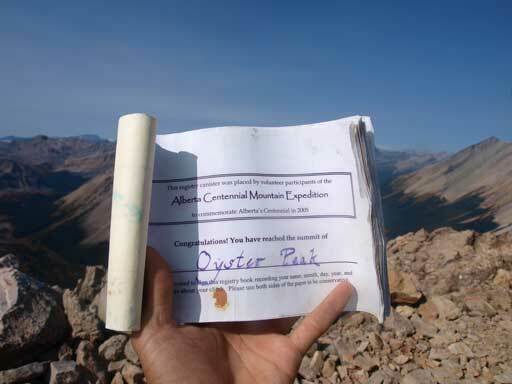 There was even a register on this false summit… From here, we got a head-on view of the giant front range peaks: Mt. Douglas and Mt. St. Bride. While Mt. Douglas is a mostly a scramble with a couple of 5th class steps and lots of of route-finding, Mt. 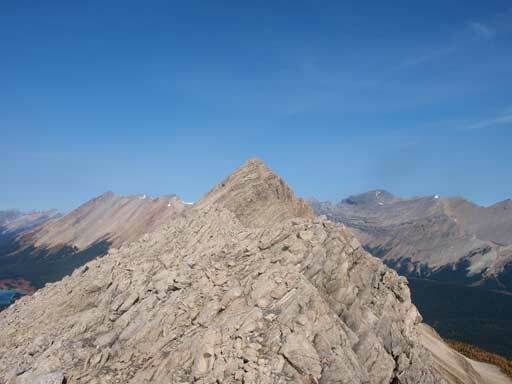 St. Bride is definitely one of the most difficult summits (by easiest route) in the Canadian Rockies. The traverse to the true summit was much longer than it appeared. And at places, the ridge got pretty exposed. 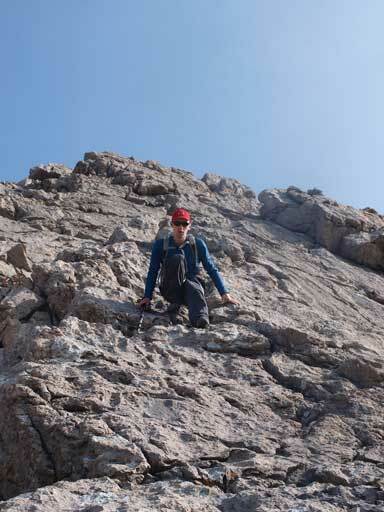 It took me more than half an hour to traverse… Near the summit, the scrambling got more involved and definitely deserves its “moderate” rating. Looking very East to the front range peaks. Prow Mountain is the left bump of this long ridge. We didn’t linger long on the summit as we still had a long way to go. The west face descent was much harder than anticipated. 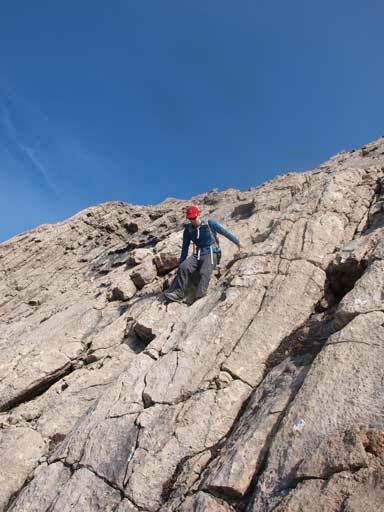 The upper mountain was guarded by slabs and we encountered difficult scrambling here and there. 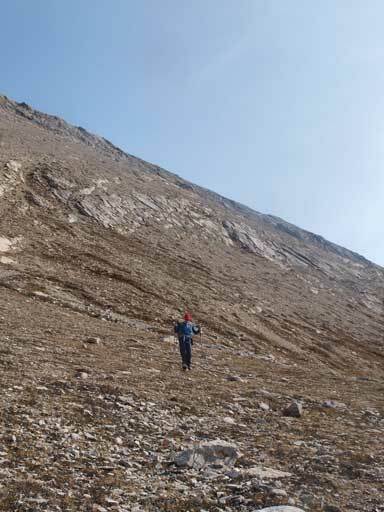 After the series of slabs, we had to descend tedious rubble. 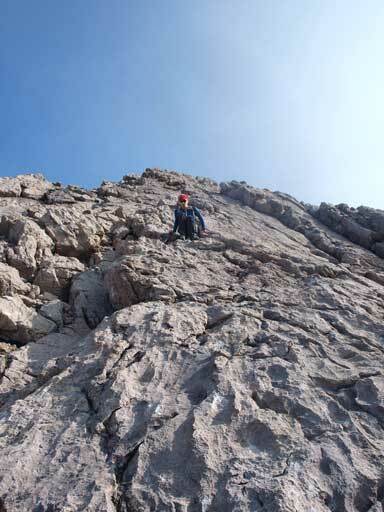 Once getting down, looking back, the route looked to be pretty serious… Good thing, no need to do it again! Mike descending one of the many slabs down the alternate route. Looking back at Oyster Peak. 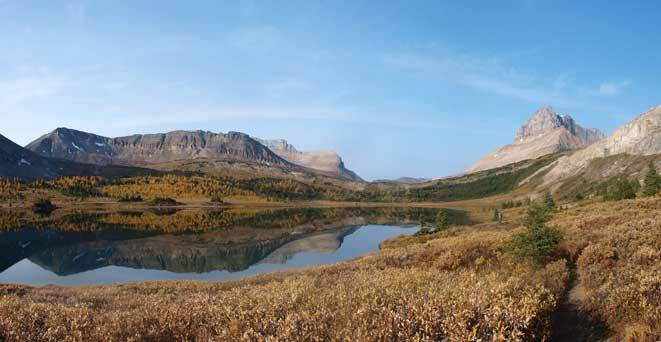 We bushwhacked down to Oyster Creek, picked up the trail, and then the next objective, Skoki Mountain!